A new bus station proposed for Victoria Point! Construction is expected to take place mid-2017 (funding permitting) on the vacant site along Cleveland-Redland Bay Road, between Bunker Road and the Victoria Point Shopping Centre and TownCentre Victoria Point access roads. The upgraded station is designed to increase capacity and provide improved network efficiency and facilities for passengers. They've basically gone with the original design as planned last year, a split platform with an outbound platform and an inbound platform. The problem is that most bus routes in the Redlands operate either every 30-60mins, and so if you have a tight connection with an outbound bus from an inbound bus (and vice versa for example), under this design, you would need to get off at one platform, walk about 60-70m to the traffic lights, wait for the lights to change, cross the road, walk another 60-70m to the other platform and hope that you've caught the bus in time. Cleveland-Redland Bay Road is also a much busier road than Bunker Road is where the current bus interchange is, which is also on one side of the road bar one stop used by route 277. I submitted a rather detailed response during the consultation process last year, but it seems that any consultation has fallen on deaf ears, and they are proceeding with the design as planned. They also snuck this one in without any media release and anything on the front page of the TransLink website. I found out by checking the projects page to see if it had been updated . I honestly feel like that they would be much better off upgrading the existing interchange and building new stops outside the other shopping centre that any bus can stop at if one feels that they wish to get off and access the other shopping centre (currently about a 600m walk from the existing bus interchange), rather than using that space to move the bus interchange that isn't suitable given the demographics (largely elderly) and nature of the roads itself and knowing that the bus routes in the area are largely low frequency, making connections and infrastructure to support connections critical. ^ thanks for this information STB. Most unfortunate. It does seems these days that they try to hide things. Feedback I've had from regular users at Vic Pt indicate they are very unhappy with the new station proposal and also a lack of parking for commuters. Lack of protection from bad weather is also a major concern. - Pedestrian movements restricted to signalised crossings - you can guarantee people will ignore them unless there is a fence in the median, and even then people won't necessarily be deterred. My god, I've just checked the renders - it's even worse than I thought! What kind of muppets design this stuff? Consultants who obviously have never caught a bus in this area and are using cookie cutter type designs that aren't suitable for the area. Then getting rubber stamped by managers and the minister's office without looking more deeper and more critically at the operational aspects of the design. I remember even back in my day working as a Network Planner, there was always a disconnect between the Planners and the infrastructure people. From the infrastructure point of view, it was simply design and build based on certain standards. While the Planners had to basically make do with what they were given. Both the Planners and the infrastructure people need to work together as an operations plan needs to feed in and fit in with the design of the area. If it's a low frequency area, then the bus station ideally needs to be a single platform or an island platform off the main road to make interchanging easier and less stressful for passengers. Why didn't they put a overhead busway style walkway plaza in it? Add lifts as well. SEQ: Victoria Point Central bus station planned upgrade botched! RAIL Back On Track (http://backontrack.org) a web based community support group for rail and public transport and an advocate for public transport passengers has said the consultation for the Victoria Point Central bus station has been shambolic and now appears that the community will be stuck with another botched TransLink project (1). "The original design for this bus station was a split platforms separated by a busy 4 lane road. Concerns have been raised that in order to make connections passengers will have to attempt to walk 60 to 70m to traffic lights, wait to cross this dangerous Cleveland-Redland road, and then walk another 60 to 70m to the other platform and hope they make the next bus connection. The platforms are divided by a main road which increases walking times, makes transfers difficult, and passengers are right up adjacent to a main road - with the risks that entails." "Despite feedback pointing out this major issue to TransLink, with other solutions, it has been ignored. 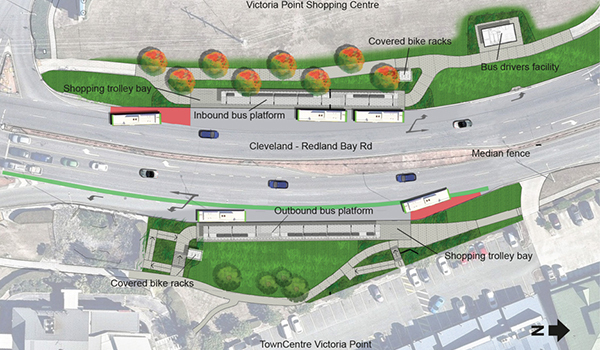 It now appears TransLink is going to proceed with the botched arrangement of split platforms on a dangerous road. Consultation has been largely symbolic and shambolic sadly. People who put in very detailed feedback have been ignored and not even given the courtesy of detailed responses (2). " "The proposed design will also cause conflicting movements between buses pulling out of the platform going straight ahead and cars turning left at the next intersection (3). "This bus region has largely low frequency bus services and it is very important that the infrastructure to support the bus network facilitates easy connections. The area also has a significant elderly demographic, who will find it difficult to use the network if this bus station goes ahead as planned." "We call on the Transport Minister, Deputy Premier Trad to stop this project and institute an urgent review. The citizens of Redlands deserve better than this planned botch." Latest: Victoria Point Central bus station planned upgrade botched!